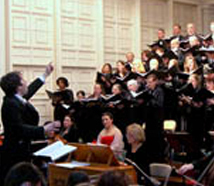 The Taghkanic Chorale is a non-profit, non-sectarian, community-based volunteer chorus. It serves talented singers and enthusiastic concertgoers from Westchester, Putnam, Dutchess, Rockland, Orange and the mid-Hudson Valley. Weekly Tuesday evening rehearsals are held at the Yorktown Church of the Nazarene, located one mile south of Route 202 via Mohansic Ave, just west of the Taconic State Parkway -- an easily accessible location to singers throughout the lower Hudson Valley.